(Press Release) On March 29, the Ally’s Wish Boots and Blessings Gala host committee and local designer Esé Azénabor welcomed more than 125 guests to the gorgeous home of honorary chair Tricia Sims for an evening of fashion and philanthropy. “A Venetian Dream,” was the collaboration of Ally’s Wish and local designer, Esé Azénabor that commenced the countdown to the Flower Mound-based organization’s second annual gala to be held at Gilley’s Dallas on April 30, 2016. After enjoying sweet treats by The Jenny Layne Bakery and sips courtesy of Sweet Beat Vodka and Community Beer, the glamorous Gina Ginsburg, Ken Weber, Chuck Steelman, Melissa Rountree, Dawn Mellon, and Allison Mitchell took their seats. All eyes turned to Mistress of Ceremonies, Real Housewives of Dallas star LeeAnne Locken and gala chair Laura Downing who thanked sponsors before introducing Ally’s Wish president, Missy Phipps. Inspired by the loss of their dear friend, Allyson Hendrickson, to ovarian cancer, Missy Phipps, Holly Reed, Melissa Cary and Heather Bryan founded Ally’s Wish to grant a last wish to young mothers battling terminal illnesses. In just two years, the women have raised more than $150,000 and granted wishes like helicopter rides over the Grand Canyon and adventures swimming with dolphins to sixteen mothers. “When dreaming up Ally's Wish, I asked myself, what would want if I were terminally ill? And the answer was obvious; memories and time with my children,” Phipps said. “Getting to know these strong moms is rewarding and bitter sweet. We get to be in their lives long enough to grant their wish, and it's a precious time that we don't take for granted.” After Phipps’ heartfelt remarks, Locken announced the organization was only $40,000 away from reaching their gala sponsorship goal of granting eight more wishes. After dozens more raffle tickets sold out in minutes, the house lights were dimmed and the models who were primed by Blushington and The Hair Bar prepared to strut the runway. 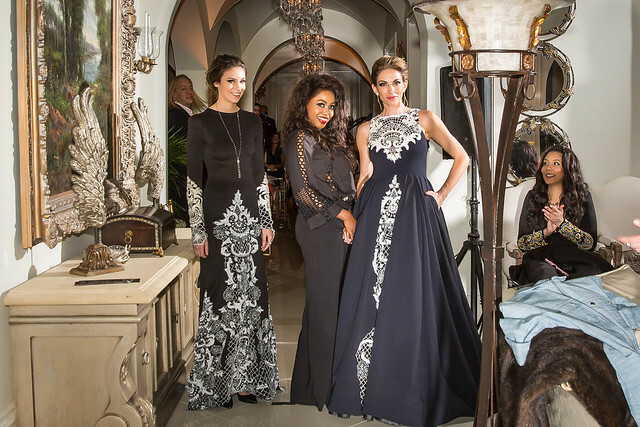 Esé Azénabor recently showcased her 2016 spring collection, Garden of Eden, at New York Fashion Week, but guests were in for a special treat as they got an exclusive preview of the Fall 2016 looks from her Venetian Dream collection. The models were accessorized in bags by D'Monti and jewelry by Couture Rocks. Cheers ensued as the runway host, Carmen Surgent, sported an incredible gown that would turn heads at Chrystal Charity Ball and the moment was captured on video by GoMan Productions. “I love the way fashion empowers me and I am thrilled to be able to showcase my current collection in Dallas to inspire other women,” says Esé Azénabor. It was clear by the crowd’s reaction to the collection, that they were dazzled by the looks walking the runway. This new Fall/Winter 2016 collection is 100% hand sewn with custom fabrics created specifically for this collection. The inspiration originated from the desire to incorporate a Venetian flair into her own home. Throughout her research on Venetian inspired homes, she became fascinated with the antic plasterwork, dramatic moldings and the unique architecture. She successfully emulated those elements in her collection through intricate beading and embroidery. Core components of her collection include materials such as silk crepe, silk mesh and silk tulle. Known for her detailed beading and embroidery work, in this collection the designer utilized a combination of Japanese glass beads, sequins and Swarovski crystals. Her last collection inspired by the Garden of Eden was very colorful whereas the Venetian Dream Collection consists of golds/blacks, white/blacks and white/gold. For more information, visit eseazenabor.com.